In what can be described as one of the most gruelling events in road racing, the 100k challenge presents competitors with an opportunity to run nearly 2 and a half marathons in one race. The Celtic 100k race was held on Saturday 28th of March in Salthill, Galway and featured a truly international field with athletes competing from Ireland, England, Wales, Scotland, Germany and Poland. Incorporated into the event was the Anglo Celtic Plate, a home countries international between Ireland, England, Scotland and Wales. Le Chéíle AC’s John O’Regan took part in this event and despite competing for the first time at this distance, put in an exceptional performance. The winner of the race Jez Bragg (England) who completed the course in a time of 6:58:00 and the first Irish man home was 6th place Thomas Maguire (7:30:56). The winner of the women’s race was Ireland’s Helena Crossan finishing in a time of 8:11:04. Leixlip man John O’Regan finished in 16th place overall with a time of 8:36:42 – Imagine running non-stop for longer than is most people’s working day! The team event was won by England with Ireland achieving 3rd place in the Celtic Cup, and the Ireland women’s team coming in third place overall after England and Scotland. Although not selected on the Irish team for this event (he did not have prior experience in this type of event) he managed to finish as the 3rd placed Irish man. I expect that John will certainly feature in Ireland's team selection in future ultra distance events. Not content with resting on his laurels, O'Regan will today be putting on his runners and forgetting about the aches and pains to prepare for his next events. He will take part in this year's London marathon (26th April) as an official pacer. The job of a pacer is to being a group of people through the marathon course at a predefined, consistent pace. A bit like the pied piper, John will lead athletes at a consistent 8 minute mile pace, to complete the marathon in under 3hours 20 minutes. The London marathon will be a training run for O'Regan's preparation for the North Face 100k run. This will be his second 100k ultra marathon and takes place in Australia's Blue Mountains on the 16th of May. This race, described by the organisers as "challenging, spectacular course through some of Australia's most iconic landscape" will present more of a challenge than the Celtic 100k, but John will have learned a lot and will be well prepared. John O'Regan will compete in the Celtic 100km this Saturday- 29th March (Is he mad?) The race is 50 laps of a 2km course in Salthill, Galway. This race is an IUA labeled race and Ireland's first official world ranking ultra-race. The 2009 Celtic 100k also decides the individual titles of the UK 100km Championships and the 100km Championships of Ireland. Congratulations to Tony Brennan who ran in the Inter & Masters Road Race held in Naas. Tony finished in 4th position overall, 1st in his Masters category and 3rd as an Intermediate. ~One race two Medals, well done. Tony and John will compete on Sunday next 22nd March in the Kildare 10k road race, not sure who will win that one! best of luck to you both. I hope that everyone is enjoying their St. Patrick's day and holiday from school and work. As that is probably enough fun for one day, we decided that to include another fun event like athletics training, would probably be too much. So there will be no training tonight! See you all again on Thursday evening. 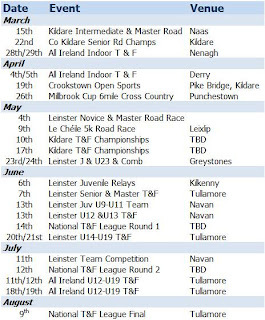 The following are the fixtures confirmed from the last Kildare County Board meeting for Kildare, Leinster and All Ireland events. Where venues are not listed, they will be confirmed closer to the date. In what appeared to be a very difficult race for David, his efforts in the semi-final of the 800m European Indoor Championship delivered a time of 1.53.53 which was not enough to progress to the final. Despite the result in the semi-final, David should be suitable proud of his achievement and his contribution to the success of the Ireland team at these championships. Overall it has been a successful Championship for the Irish team, which saw two Bronze medals, 5 finalists, 4 personal bests, 2 seasonal bests and an Irish Record. In a quote from Team Manager, Patsy McGonagale he said, "From start until finish it has been a great performance from everyone involved. Every athlete out there gave their best and on certain occasions we may have even come back with more medals if you look at how close Róisín and the relay team were. All in all this has been a great success and we can all look positively towards the Worlds in August now". All of us in Le Chéile look forward to following David's progress as he prepares for qualification for the World Championships as part of the Ireland team. We will be resuming outdoor training for all on next Thursday (12th). Times for training session will be as per Tuesday (19:45 - 20:15). For those of you who have not been training outdoors yet this year, dont forget to put on plenty of layers and bring a light rain jacket - it can still be very cold until we get further into spring. An excellent race from David in his 800m heat, recording a time of 1.49.59, led to a semi-final place as the fastest runner-up. The semi-final of the 800m European Indoor Championship will be held on Saturday (7th) at 16:30. The race will be broadcast live during the BBC coverage of the event and we'll all be their with David in spirit. Congratulations to Le Chéile athlete David McCarthy who earned his place on the Ireland team for the European Indoor Championships. David was selected to join the team based on a very impressive win at the Celtic Cup Indoor International event held at the start of February in Cardiff. He produced a personal best in the 800m event to finish in 1:49.12. David will join the team of 20 of Ireland's best athletes to compete in the championships which will be held between the 6th to 8th of March in Turin. We wish David the very best in Turin and will all be closely following his progress. Click here to see results from David's previous performances.